I am so excited to present this workshop on January 11th at Bird Rock Yoga! Over the years, I've been working in group settings and one-on-one with yoga students, friends and family members to help them adapt the lessons learned on their yoga mat and apply them directly to their lives. A big lesson we all come across is facing fear - whether through attempting a handstand or learning how to sit still and be alone with our breath - fear comes up A LOT in yoga. And also in our lives! With each new challenging yoga pose we attempt, we cultivate bits of courage and strength that can be applied to other areas of our lives. This courage and strength helps us break through negative patterns, self-doubt and fear, so that we can start to pursue goals and dreams and start living our best lives. I hope you'll join me this Saturday! Be the happiest person you know in 2014! Detox your mind, body, and soul with this 2 hour purifying experience. 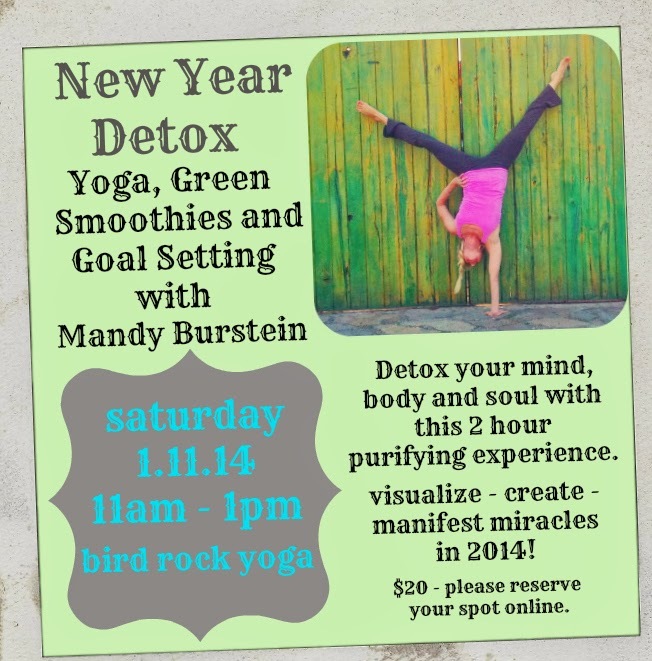 Mandy Burstein will guide you through a powerful 90 minute yoga practice, followed by delicious green smoothies and a 30 minute goal setting session to teach you how to visualize and create positive manifestions for the year ahead.